Premature loss of pulpally involved primary teeth is a common problem in this part of the world. Retention of pulpally involved primary tooth to preserve arch space is preferable where endodontics, often remains the only option. Hence, an invivo study was designed and carried out to evaluate clinical and radiographic efficacy of zinc oxide eugenol and (Metapex) as root canal filling materials in primary teeth for a period of 6 months. A total of 34 patients were selected from the Department of Pedodontics and Preventive Dentistry, Dr R Ahmed Dental College and Hospital, Kolkata in the age group of 4 to 7 years. These 34 patients had 42 teeth treated with root canal therapy. The selected patients were supposed to fulfill following criteria. Patients with clinically and radiologically diagnosed infected primary teeth in mandibular arch were included in the study. Teeth were deep carious, with history of spontaneous pain and carious exposures of the pulp were also selected [Figure 1] and [Figure 2]. Care was taken to exclude non-restorable teeth from the study. A tooth was selected, if the following radiographic criteria were present: adequate alveolar bone support, absence of internal resorption, absence of external pathologic resorption. Teeth with radiographically evident inter-radicular and peri-radicular radiolucencies were included in the study. 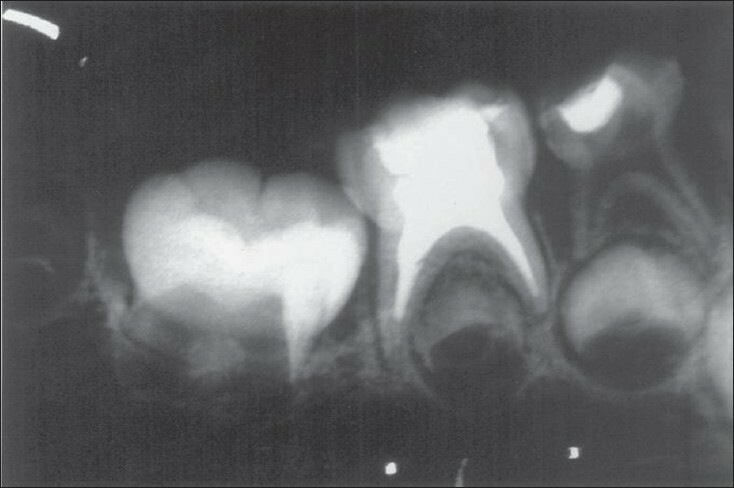 Group I (21 teeth): The root canals of patients of this group were obturated with Zinc Oxide Eugenol paste (ZOE). Group II (21 teeth): The root canals of patients of this group were obturated with calcium hydroxide iodoform paste (Metapex). To start with, after rinsing with (0.2% chlorhexidine gluconate mouthwash), inferior alveolar nerve block was given to patient and rubber dam was applied for isolating the tooth. The coronal pulp tissue was removed with a spoon excavator. Radicular pulp tissue was removed with fine barbed broaches. The working length was determined by superimposing an endodontic instrument over the pre-operative radiograph and keeping it 1−2 mm short of radiographic apex. The cleaning and shaping of the canals was carried out using Hedstrom files (21 mm). The files were used sequentially in a pull back direction upto a maximum size of No. 30. Irrigation with sodium hypochlorite 2.6% and normal saline was continuously done throughout the instrumentation. 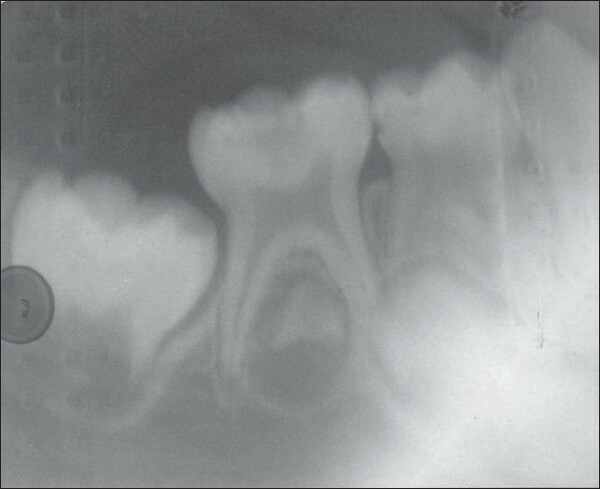 The root canals were obturated with ZOE paste in Group I (0.36 gm powder, 0.28 gm liquid) and with Metapex in Group II. ZOE paste was made by mixing Zinc Oxide powder with Eugenol to make mixture of adequate consistency. 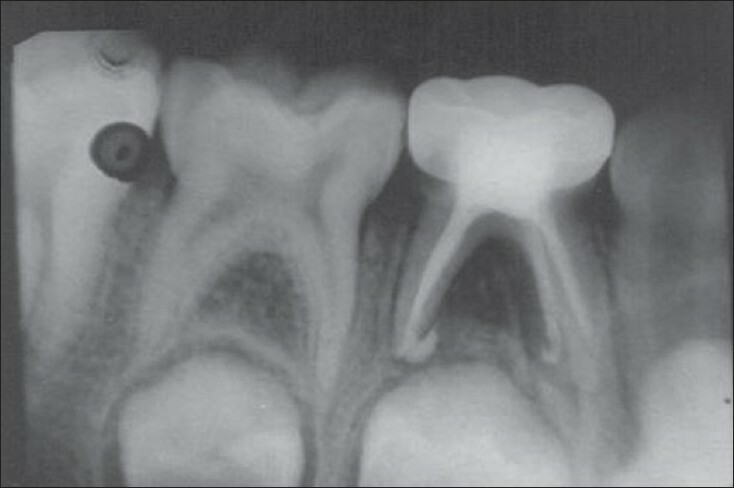 Obturation of the root canal; for group I: A thin coating of ZOE is coated on to the wall of canals. The paste was carried to the canals in small increments with hand pluggers. The paste was deposited in the canals with plugger rotating in an anticlockwise direction while taking out slowly followed by subsequent increments till the complete filling of the canals was achieved. A thicker mix of ZOE was then placed as a temporary sealing material. In Group II, the canals were filled with Metapex. Here, the Metapex, which is supplied in a pre-packed polypropylene syringe, was transported directly to the canals. The syringe was inserted into the canals. The paste was pressed down into the canals and when the paste flowed back from the canals into the pulp chamber, the syringe was slowly withdrawn. The paste was filled only in the root canals and not in the pulp chamber. A thicker mix of ZOE was placed in the pulp chamber and as a temporary sealing material. 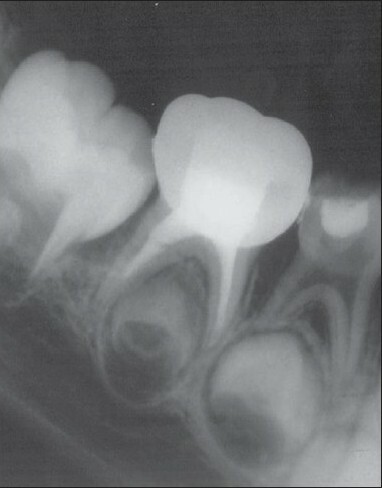 An immediate post-operative intra-oral peripical X-ray was recorded for each obturated tooth [Figure 3] and [Figure 4]. The treated teeth were permanently restored with silver amalgam, glass ionomer cement or stainless steel crowns. Following clinical signs and symptoms were recorded pre-operatively, immediate post-operatively and at further follow-up examination for 3 and 6 months [Figure 5],[Figure 6],[Figure 7],[Figure 8]. 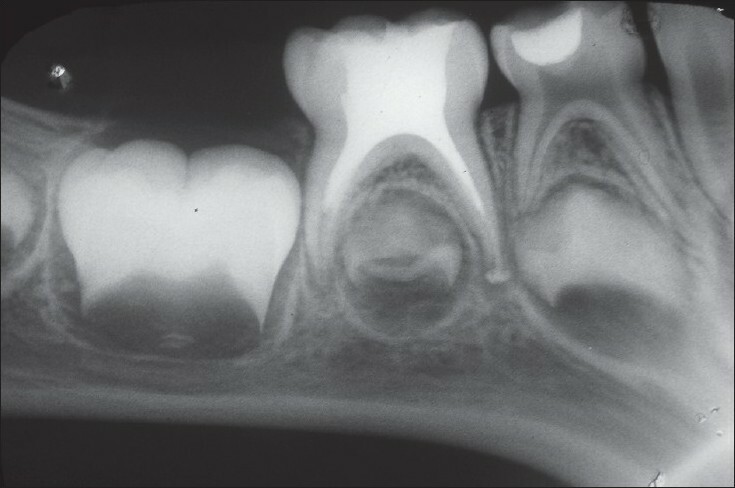 Figure 6: Radiograph of the same tooth taken 6 months postoperatively after root canal filling done with zinc oxide eugenol. 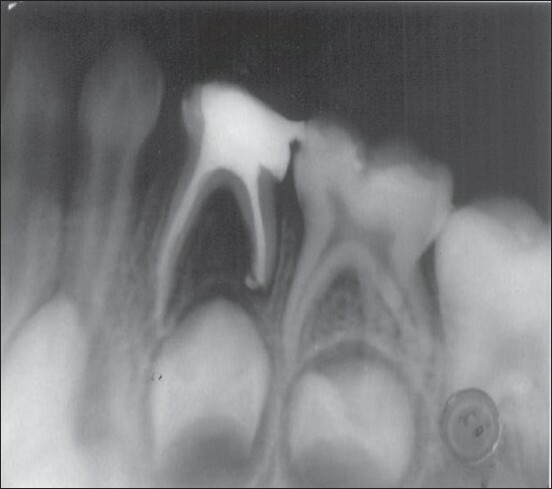 Figure 8: Radiograph of the same tooth taken 6 months postoperatively after root canal filling done with metapex. Presence or absence of gingival swelling/sinus tract, abnormal mobility, pain on percussion, spontaneous pain. The following radiological findings were recorded pre-operatively, immediate post-operatively, and evaluated at further follow-up examination for 3 months and 6 months, that is, presence or absence of radiolucency. The cases treated were considered successful clinically if there was absence of pain, tenderness on percussion, pathology, and absence or decrease in mobility. The cases were considered successful radiographically, when the radiolucency demonstrated signs of resolution, or arrest. Increase in size of radiolucency, at 6 month examination was considered as a radiographic failure. The results obtained from this invivo study were then tabulated and statistically analyzed. A total of 42 mandibular primary molars, in the age of 4−7 years were endodontically treated in two groups (Group I and Group II). The patients were examined for clinical and radiographic symptoms prior to the procedure that was recorded. The pre-operative and follow-up clinical and radiographic factors are summed up in the table [Table 2],[Table 3],[Table 4],[Table 5],[Table 6],[Table 7],[Table 8]. Majority of the teeth presented with pain, tenderness to percussion, mobility, gingival swelling or sinus tract. At 6 month review in Group II, only 1 teeth complained of pain, 1 teeth complained of tenderness to percussion and none of the teeth complained of mobility and gingival swelling or sinus tract. Clinically, postoperative evaluation revealed that there was reduction in clinical signs and symptoms, which was statistically highly significant but the difference between the two groups (P > 0.5) was not significant statistically. Radiographic assessment showed progressive healing of the radiolucencies with the passage of time. 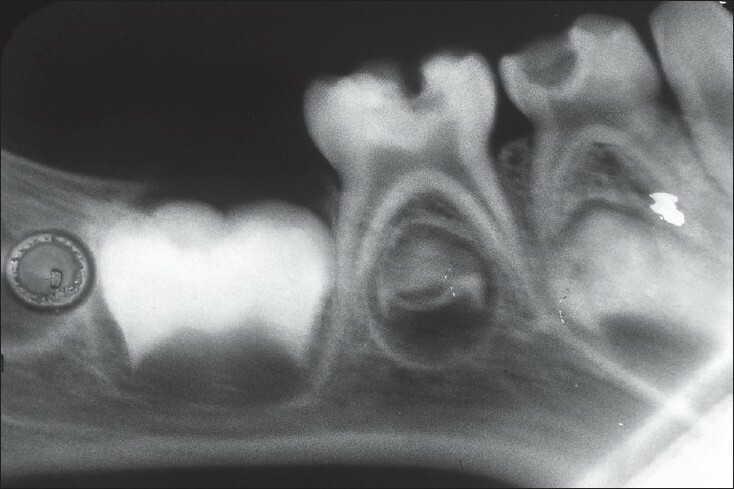 At 6 month review, only 1 teeth in Group II showed radiolucency and resorption of overfilled material was seen in Group II [Figure 9],[Figure 10],[Figure 11],[Figure 12]. 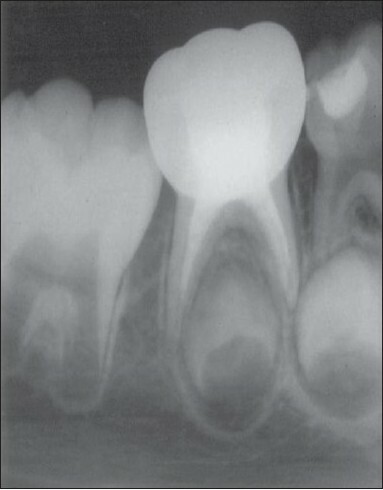 Figure 9: Radiograph of a mandibular first deciduous molar taken immediately postoperatively showing significant amounts of extruded zincoxide eugenol. In the present study, the success of the treatment was determined after a period of 6 months. In Group I (ZOE) the success rate was 85.71%, i.e., 18 out of 21 teeth and in Group II (Metapex) it was 90.48%, i.e., 19 out of 21 teeth, were considered successful as these teeth were asymptomatic and clinical as well as radiographical signs of pathology were absent. ZOE, since its discovery by Bonastre (1837) and subsequent first use in dentistry by Chrisholm (1876), has been used extensively in dentistry. It is the most frequently used root canal filling material for primary teeth. Success rates of Holan and Fuks (1993)  noted 65%, Reddy V.V.S. and Fernandes (1996)  noted 80%, Nadkarni and Damle  noted 88.57%, Mortzavi and Mesbahi (2004)  noted 78.5% success rate with ZOE. Previous studies have shown several disadvantages with the use of ZOE paste in root canals of primary teeth. 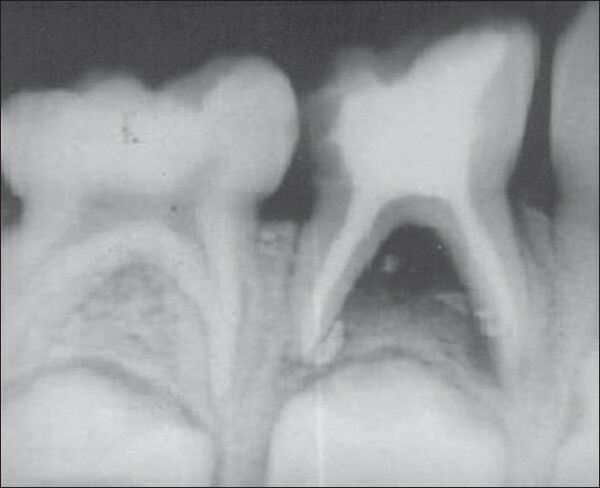 Erausquin and Muruzabal (1967)  showed that it is irritating to the periapical tissues and may produce necrosis of bone and cementum in rats. Calcium hydroxide has been used virtually as an all purpose medicament in dentistry. Recently, it has been used as a root canal filling material in primary teeth with considerable success (Rosendahl R. and Weinert Grodd A., 1995). The combination of antibacterial, resorbable, and tissue compatible properties make it feasible for use in primary teeth. Iodoform is another material, which is commonly used in root canals of primary teeth. Iodoform is used either in pure form or is combined with other materials. It is a potent bactericidal, non -irritatant, radiopaque, and well suited for a non-shrinking and non-soluble paste. It is a resorbable paste, also the rate of resorption is faster than ZOE material. ,, Especially, resorbability makes it ideal for deciduous teeth, which are resorbable in nature. Dominguez et al (1989)  and Kubota et al (1992)  suggested, combining calcium hydroxide with iodoform gives excellent clinical, radiographic, and histological results. 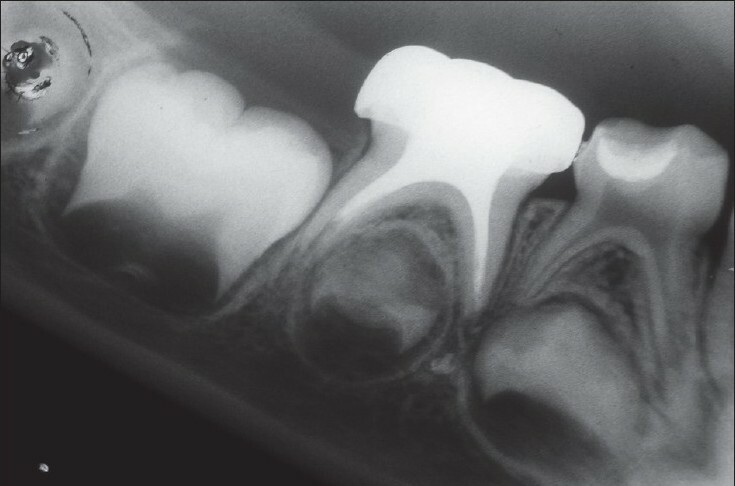 More recently, the mixture of calcium hydroxide and iodoform is being used to obturate root canals of primary teeth. The main ingredients of these calcium hydroxide-iodoform paste (vitapex, metapex) are calcium hydroxide 30.3%, iodoform 40.4%, silicone oil 22.4%, others 6.9 %. This mixture can be filled in the root canals using disposable tips, which are delivered with the material. The silicone oil, here, is thought to neutralize some of the alkalinity of the paste causing lesser injury to the periapical tissues which is shortlived. Machida (1983)  found calcium hydroxide iodoform paste (Vitapex) to resorb a little faster than the rate of root resorption. He found the mixture easily applicable, to have no toxic effect on permanent successors, and to be radiopaque. He considers calcium hydroxide iodoform mixture to be a nearly ideal pulpal filling material for primary teeth. The results of the present study are comparable to Holan G. and Fuks. A (1993)  who reported a success rate of 84 % with KRI as compared to 65 % with ZOE. Reddy V.V.S and Fernandes (1996)  have reported 100 % success with use of Maisto's paste and 80% with ZOE. Nadkarni and Damle (2000)  has reported 94.28% success with the use of Calcium Hydroxide and 88.57 % success with the use of ZOE after 9 months. Mortazavi and Mesbahi (2004)  reported success rate (clinical and radiographic) was 100 % for Vitapex and 78.5 % for ZOE at the 10−16 month follow-up period. The present investigation indicated that reduction in clinical signs and symptoms and healing of periapical pathology as evidenced by resolution or arrest of radiolucency was present with both the materials used. However, a gradual but almost complete reduction in preoperative signs and symptoms and a faster resorption of overfilled material was observed with Metapex. The findings of the present investigations indicate that Metapex could be used as an alternative to ZOE as a root canal material. However, further longitudinal study involving a larger sample size is necessary to evaluate and also the teeth treated in this study need to be monitored until their eventual exfoliation. 1. Garcia-Godoy F. Evaluation of an iodoform paste in root canal therapy for infected primary teeth. ASDC J Dent Child 1987;54:30-4. 2. Rifkin A. A simple, effective safe technique for the root canal treatment of abscessed teeth. J Dent Child 1980;47:435-41. 3. Erausquin J, Muruzabal M. Root canal fillings with zinc oxide eugenol in the rat molar. Oral Surg Oral Med Oral Pathol 1967;24:547-58. 4. Nurko C, Garcia-Godoy F. Evaluation of a calcium hydroxide iodoform paste (Vitapex) in root canal therapy for primary teeth. J Clin Pediatr Dent 1999;23:289-94. 5. Nurko C, Ranly DM, Garcia-Godoy F, Lakshmyya KN. 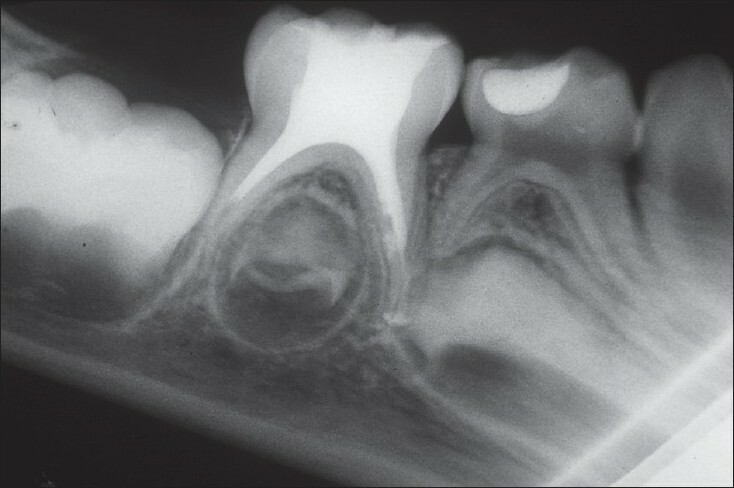 Resorption of a calcium hydroxide / iodoform paste (Vitapex) in root canal therapy for primary teeth. A case report. Pediatr Dent 2000;22:517-20. 6. Kawakami T, Nakamura C, Hasegawa H, Eda S. Fate of 45Ca labeled calcium in a root canal filling paste embedded in rat subcutaneous tissues. J Endod 1987;13:220-3. 7. Thomas AM, Chandra S, Pandey RK. Elimination of infection in pulpectomized deciduous teeth: A short-term study using iodoform paste. J Endod 1994;20:233-5. 8. Holan G, Fuks AB. A comparison of pulpectomies using ZOE and KRI paste in primary molars: A retrospective study. Pediatr Dent. 1993;15:403-7. 9. Reddy VV, Fernandes. Clinical and radiological evaluation of zinc oxide eugenol and Maisto's paste as obturating materials in infected primary molars - nine months study. J Indian Soc Pedod Prev Dent 1996;14:39-44. 10. Nadkarni U, Damle SG. Comparative evaluation of calcium hydroxide and zinc oxide eugenol as root canal filling materials for primary molars. A clinical and radiographic study. J Indian Soc Pedod Prev Dent 2000;19:1-11. 11. Mortazavi M, Mesbahi M. Comparison of zinc oxide eugenol and Vitapex for root canal treatment of necrotic primary teeth. Int J Paediatr Dent 2004;14:417-24. 12. Barker BC, Lockett BC. Endodontic experiments with resorbable pastes. Aust Dent J 1971;16:364-72. 13. Kennedy DB. Pediatric operative dentistry. Bristol; John Wright and Sons; 1976. 14. Allen KR. Endodontic treatment of primary teeth. Aust Dent J 1979;24:347-51. 15. Markowitz K, Monihan M, Liu M, Kim S. Biologic properties of eugenol and zinc oxide eugenol. Oral Surg Oral Med Oral Path 1992;73:729-37. 16. Rosendahl R. Weinert Grodd A. Root canal treatment of primary molars with infected pulps using calcium hydroxide as a root canal filling. J Clin Pediatr Dent 1995;19:255-8. 17. Castagnola L, Orlay HG. Treatment of gangrene of the pulp by the walkoff method. Br Dent J 1952;93:93-102. 18. Reyes AD, Reina ES. Root canal treatment in necrotic primary molars. J Pedod 1989;14:36-40. 19. Kubota K, Golden BE, Penugonda B. Root canal filling materials for primary teeth. A review of literature. ASDC J Dent Child 1992;59:225-7. 20. Machida Y. 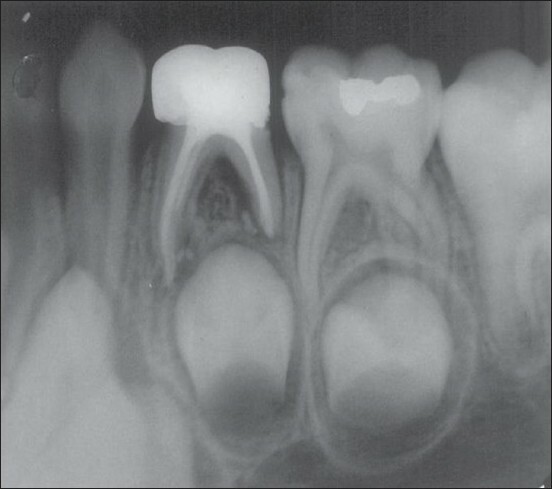 A clinico-radiographical study of root canal filling in the deciduous teeth with Vitapex. Japanese J Pedod 1978;16:360-5. Ã–znurhan, F. and Ã–ztÃ¼rk, C. and Kapdan, A.